Common Cold is probably the most common infection that a baby catches and you can expect this to happen at least 5 times in the first year! However much you try to protect your child from cold and cough, they are bound to happen every once in a while. Babies are more prone to catching different kinds of infections and diseases. They can’t fight bacteria, viruses and other infection-causing germs as easily as adults. Babies immune system is still in the developing stage and it is not yet fully equipped to fight infections. 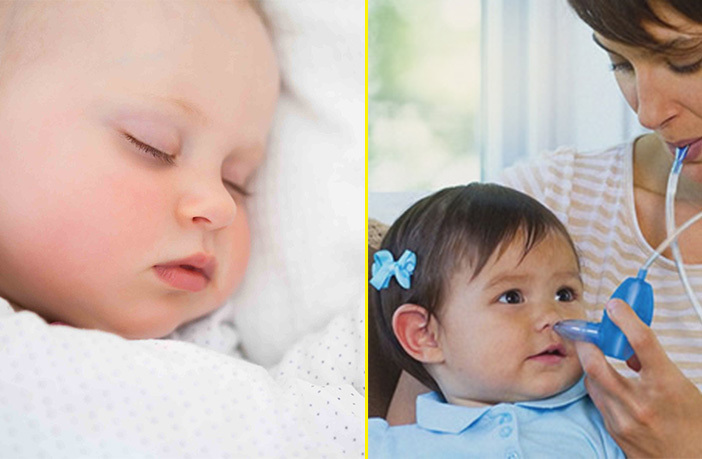 Babies catch a cold and cough easily, so you can try these home remedies to treat cold and cough in babies and kids. Why do babies and kids catch a cold? 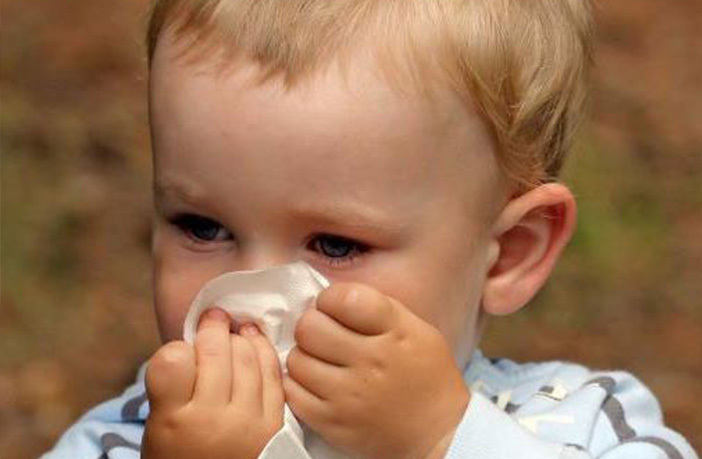 Viruses in the air are the cause for cold and cough in babies most of the times. Seasonal changes – extremely cold or extremely hot weather conditions can also trigger a cold. Once you sense that your child has a blocked nose, parents usually get tensed but look at it this way – the cold is the body’s way of throwing mucus out of the body. Most of the times, a baby may also experience a cough along with a cold. Why home remedies to treat cold and cough? Yes, it is very troubling to see your little one in pain but parents can try to avoid medicines as far as possible. One does not have to rush to see a doctor for a cough and cold every time. Doctors may prescribe medicines and antibiotics which have long-term effect on the child. Hence, it is advisable to try home remedies which have absolutely no side effects – and you can visit a doctor after a couple of days if things don’t improve. The Indian kitchen is a mini pharmacy as almost all Indian herbs and condiments can be used to cure a common cold and cough. 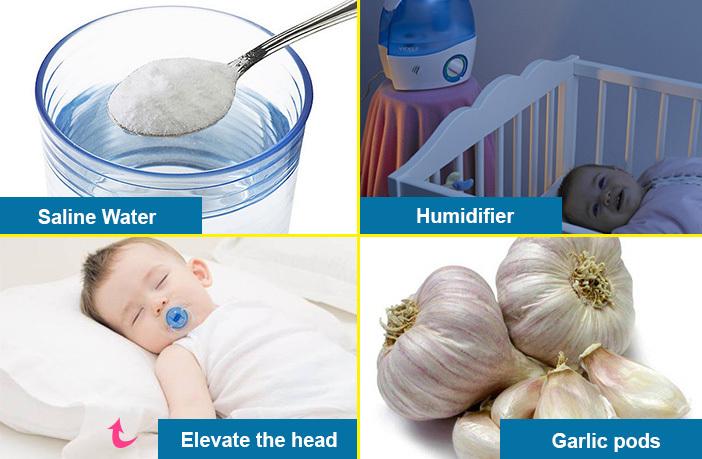 Here are a few home remedies based on your baby’s age that can help to get rid of the cold and cough naturally. Use a saline solution to clear the nasal congestion. This is also available commercially in the form of nasal drops, which are easy to administer. Congestion in the child’s chest makes breathing difficult which is aggravated with dry air. Place a humidifier in the room so that it is easier for the child to breathe. This age-old remedy is really useful. Just tie 7 garlic pods in a small piece of cloth and keep near to the baby at night. Make sure the pod is well secured and does not open. While your baby is sleeping, keep his/her head elevated by propping an extra pillow under his head. This makes breathing easier for them. 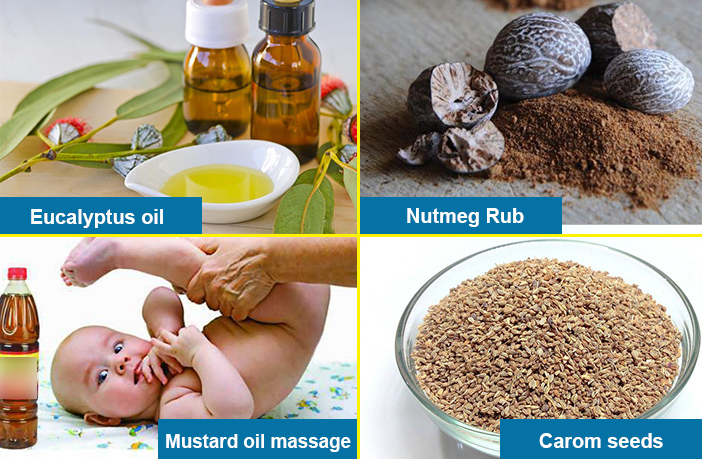 Massage your baby’s chest with lukewarm mustard oil mixed with garlic cloves. Garlic has antibacterial properties, while mustard oil provides warmth. Babies love to be massaged and this oil reduces congestion. Carom seeds or ajwain can be heated and tied in a clean fresh cotton handkerchief like a potli. Now use this potli as a hot compress on the chest and back. This potli can also be kept in the sleeping bag or near the head of your baby so he gets the smell throughout the night. You can also add garlic peels to this as garlic has a strong aroma and will help to clear the nasal passages. Just rub a piece of nutmeg (jaiphal) on the grinding stone and mix this powder with 2 teaspoons of cow milk. Now apply this paste on the forehead of your child. Wipe off after some time. Breast Milk gives comfort to the child and you should keep feeding on demand. Breast Milk has antibodies that help to boost immunity of the child. A sacred plant in Indian culture – Tulsi can be found in almost every Indian home. Tulsi has antiviral, antibacterial and antibiotic properties that can help to cure cold and cough. For small babies of 3 to 6 months age, you can heat tulsi leaves in oil and then give the massage with it. Note: Continue to offer breast milk as it helps to build immunity and fight infection. Use a saline solution and bulb suction pump to squeeze out mucus from the nose. This will clear nasal passage and allow easier breathing. If the weather isn’t too cold, you may give a warm bath to your child as this also helps the body to relax and the nose to get unclogged. Give your child plenty of warm water as this helps to prevent dehydration. Lukewarm water provides the relief from the congested chest and dry cough. 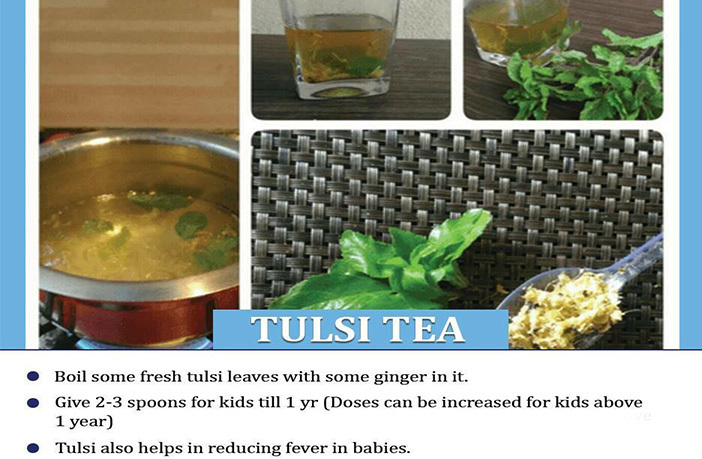 Offer lukewarm tulsi concoction/tea to your baby. You can make this and store in a bottle and keep giving throughout the day. If your child likes soups, you can give lukewarm chicken soup or vegetable soup. This helps to soothe the throat and also improve immunity. Honey should not be used for babies less than 1 year of age. However, now your child is above 1 year then you can safely use honey in the following ways. Honey is a very effective home remedy and kids like the sweet taste. Honey in Warm Water – Mix half a teaspoon of honey in warm water and make your baby drink it. Honey Ginger Mix – Honey can also be given with a few drops of ginger juice with garlic paste and cinnamon powder to tame a cough. Cinnamon Honey Tea – You may also prepare tea using cinnamon sticks and add honey to it. Give it to your child with a spoon when lukewarm. This is a very effective homemade cough syrup recipe that doesn’t contain any additives and can be stored for 4 – 6 weeks. Give twice daily to your child. Turmeric has antiseptic properties which help in treating viral infections and cough & cold. Mix a teaspoon of turmeric powder in a small amount of lukewarm milk. Most children don’t like it so you must add a teaspoon of honey to sweeten it and make your child drink it. Make small balls using jaggery, ajwain and black pepper powder and make your child keep it in his mouth. These sweet balls will be well-liked by your munchkin and help to reduce the cold as well. Allow your child to have steam with natural vapor rub in the water. It helps to unclog the nose instantly. For a child over 4 years, gargling with salt water is also a good option. Monitor your child while he does it as they don’t like to do it. Give your child a piece of liquorice (mulethi) to keep inside the mouth. Mulethi has many antibacterial properties which help to cure a child’s cough and cold. You can boil the mulethi in water and give this water to your child to drink. Use the green moringa or drumstick leaves and warm them with 1/2 cup of coconut oil in a heavy bottomed pan. Use this as your baby’s hair oil during cold and cough for much-needed relief. Make your child gets as much sleep and rest as possible as it will help his body to recover. Let your child rest by making him sit in bed and reading a story to him. You can breastfeed your child to let him sleep. Vaccination – Get your child all the mandatory vaccines on time. Try not to miss any dates as mentioned on the Vaccination chart. 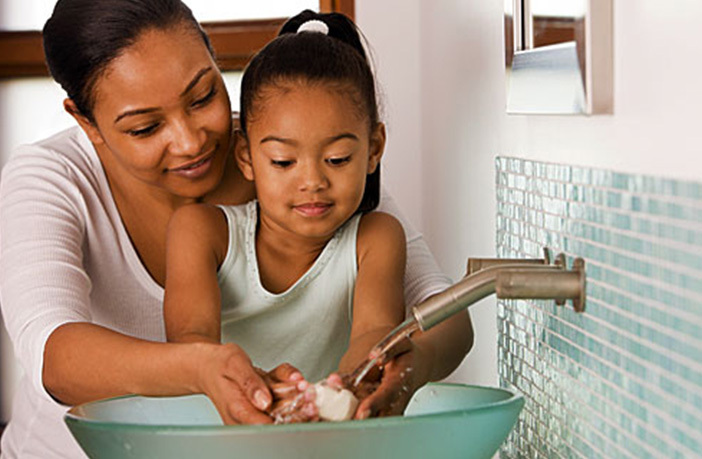 Maintain hygiene – Encourage your child to wash hands before and after meals, after potty and after playing. Set an example by doing it yourself. Avoid Sharing cups and glasses – Yes, we know Sharing is Caring and we teach that to kids all the time but not when you’re also spreading germs around. Prevent your child from sharing cups, glasses and spoons with family members. You never know who is carrying germs! Cover your mouth while sneezing – Teach your child to cover his mouth while coughing and put a hand over his nose while sneezing to avoid germs from spreading. Avoid sharing towels/ hanky – You’re not showing love to your child by letting him use your towel. Let your child use his own towel while wiping hands. Healthy Diet – Give your child a healthy diet with all the essential nutrients so that his body becomes resistant to germs and infections. Avoid junk food as far as possible. 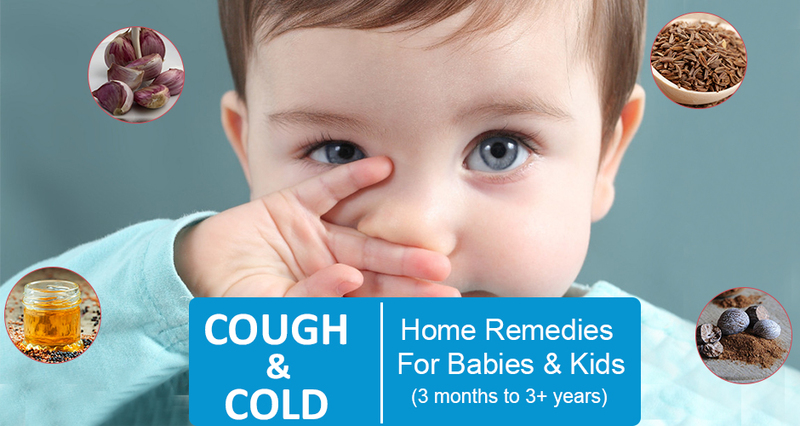 Hope mommies found these home remedies for cold and cough is useful. What is your go-to home remedy? Share below! !